Before you start reading, I highly encourage you to play the game yourself. Reading about it can be interesting, but I think you should also experience it for yourself! 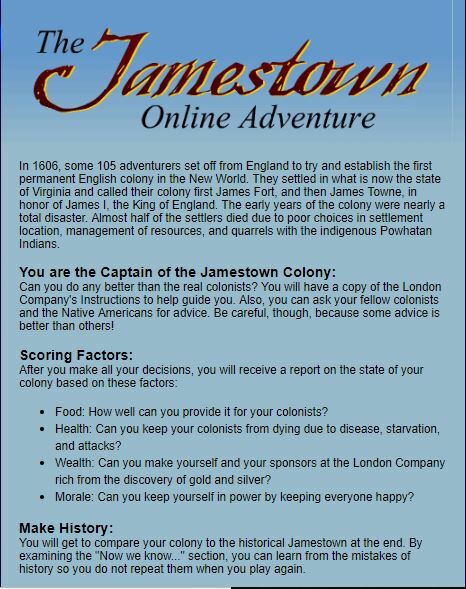 The Jamestown Online Adventure was created in 2002 by Bob Dunn, a native Virginian and “lifelong lover of history.” It’s a choice-driven game where the player acts as the leader of the newly settled Jamestown Colony in 1606 Virginia. Players are tasked with deciding what they think is best for the colonists and are faced with a series of scenarios. There are no “right” or “wrong” answers, but there are four factors that get scored at the end of the game: Food, Health, Wealth, Morale. The scoring for these can range from “poor” to “good.” If the player does particularly well, they’ll even be promoted to governor of Jamestown (I wasn’t my first time playing…). The game is pretty easy to play and doesn’t take a long time to finish (It took me less than ten minutes). It’s also not content heavy, with most of the history presented at the end of the game when players get their results; however, there was a primary document from 1606 I was able to refer to when making my decisions. It was an instructional guide actually used by the real Jamestown colonists to help them when they firs arrived in North America. It was interesting to read and definitely a great learning experience for players to become familiar with primary sources; however, I also think the document’s language could be difficult for some users. It might be helpful if there was a brief summary outlining the major points in the charter. In addition to the charter, players can also ask colonists and Natives already living in North America for advice. Some of the decisions they help out with include: Where the colony should settle (Inland? Right along the coast? On an island? ), how should the colony interact with Native Americans (ignore, attack, or trade with them? ), how should the town be built (An open village, a wooden fort, or a castle? ), and what should the colony plant (corn, wheat, tobacco?). If a player wants to ignore the charter and not consult anyone before making a decision, they can do that to. The flexibility to play however you want was a definite strength of the game. There are multiple decisions that result in many different outcomes, so player experiences can differ from one another. I played a few times and got different results each time. At the end of the game, players get their results. It describes how they scored for each factor and how their decisions effected the new colony. After going through their results, players can select “Now we know…”. 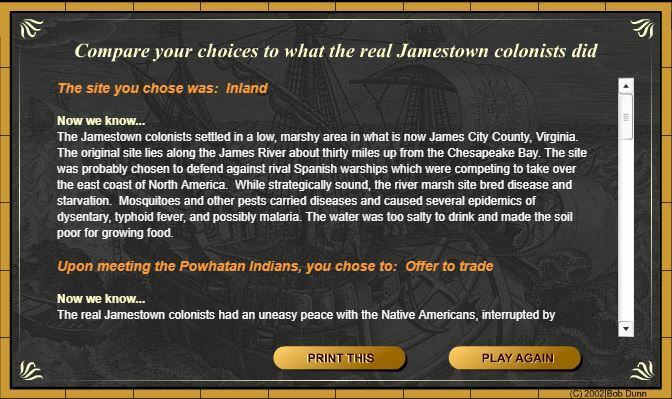 This page compares what the player chose to what the actual colonists of Jamestown did. 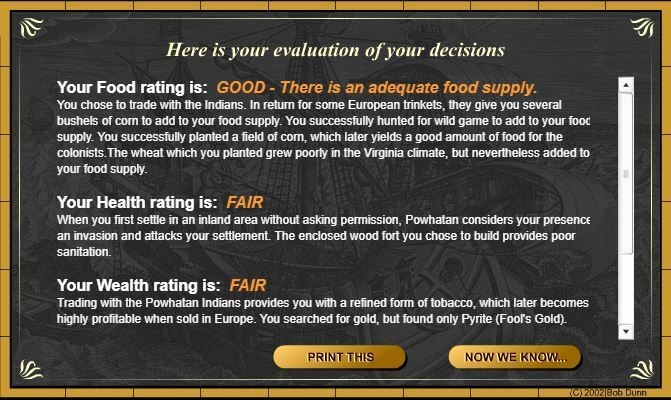 I believe that this is one of the most important parts of the game because it provides players with more history about Jamestown and gives them a better understanding of how the decisions they just made were real dilemmas early colonists experienced. Dunn also describes this section as “making history” on the game’s homepage. The game may seem simple, and in certain ways it is, but its users can still experience a better and more personal connection to the past, especially since they’re playing this game in the shoes of an early colonist. A game like this can offer players some great learning opportunities. I can see The Jamestown Online Adventure being used as a beneficial and interactive learning tool in classroom lessons (and I’m sure it already is). Not every student is interested in online games, and not every schools has the resources to give students a chance always play them. 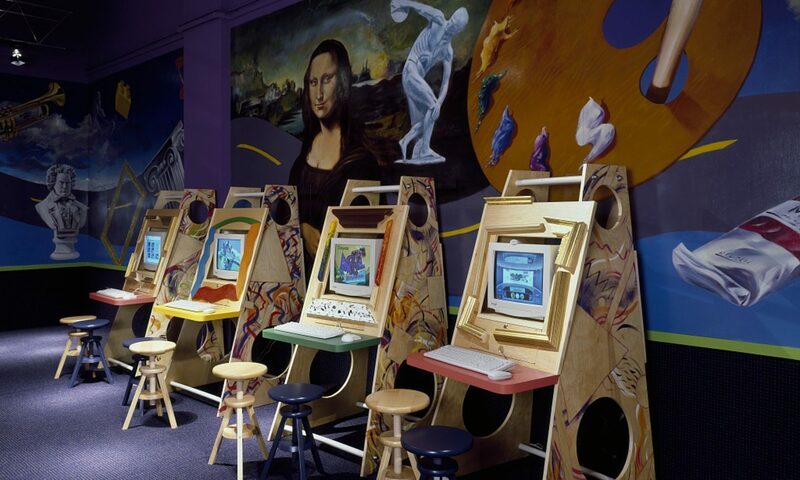 If a teacher is able to use this in their classroom, it can add some more depth to their lessons while giving their students the opportunity to learn history in a new way. Thanks for a great post Melyssa! I definitely agree with you that the primary document language is likely too difficult for some students to understand or to find worth reading. I’d be curious to see what this game could look like with higher tech and more money put into the development process because ultimately I think it teaches history in an interesting and compelling way. The primary source section could definitely be improved by including a scan of the source. At the moment it only comes across as hard to read; the historicity of it is unclear. I also think it would be helpful if students could scroll over the text for more “readable” language. 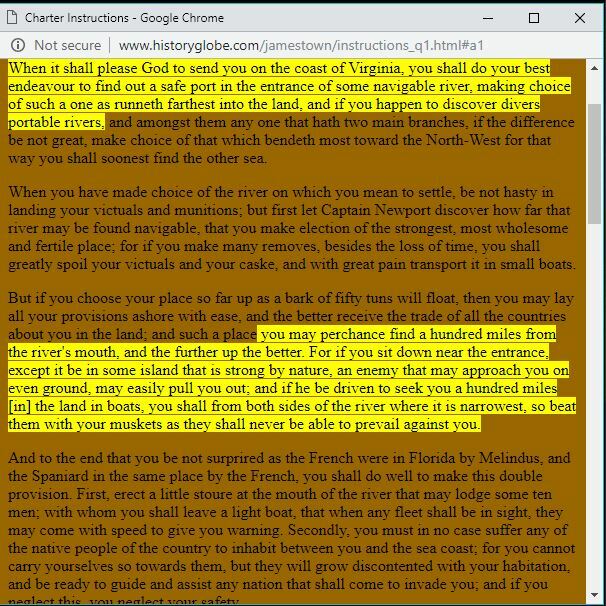 This could include breaking down the text into simpler words/sentence structure—both for easier comprehension for students, but also to help students learn how to read primary sources and to give them the confidence to do it. Great post! Thanks for the thorough description and encouragement to play the game. This game reminds me a lot of Civilization, one of my favorite computer games, in the sense that it’s choice driven and allows users to understand historical consequences through each move. I agree that this game is a great addition to a classroom lesson; however, I would hope the teacher fills in the gaps of historical accuracies. Games like these, Civilization included in the list, they tend to romanticize colonialism. As it is a fun way to get students and the general public engaged in history, I think it’s a wearisome path to romanticize difficult history. Thanks for the post Melyssa! I was impressed by the usability of the game, as well as its attempts at inclusivity. A lot of our readings this week pointed out how video games are aimed at, and tend to portray, white men. While I did notice all of the colonists were male, I thought it was important to note that it still gave a voice to the native tribes the Jamestown colonists encountered, and factored in their needs and reactions into how well you as the player were scored. While it isn’t a complex discussion of colonist-native relations, the game overall is simple, and so it fits into that framework. Lastly, I really agree with your point about the “Now we know…” section that compares what you did with what the Jamestown colonists did. It gave important context to the decisions players were asked to make, and explained how these decisions affected the Jamestown colonists.